The spectacular northern Adriatic coast of this diverse country borders Italy, just 120 miles from Venice. 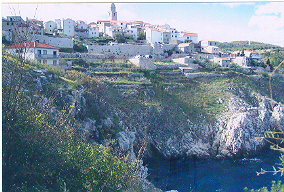 Although beautiful, unspoiled Croatia looms high on the list of choice vacation spots for many Europeans, it appears that only American travelers in the know have discovered this land of culture, towering mountains, wineries, clean air, fresh water, scrumptious cuisine, resorts and one of the most spectacular coastlines in the world which features more than 1,000 islands. An additional draw is the cost of vacationing there as well as the fact that most locals speak English. It is one of the few places that Americans can stretch their vacation dollars by converting them into Croatian kuna since Croatia is not yet a member of the European Union where the worth of the American just keeps sinking. 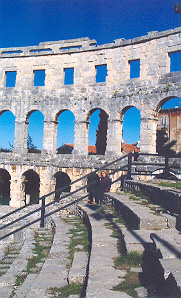 Due to its occupation by so many other countries in the past, Croatia’s architecture is widely varied as is its cuisine, reflecting the cultures of its past conquerors including Italy, Hungary, Austria and Turkey. Foodies and oenophiles are sure to enjoy visiting Croatia where it is not unusual to be served five course meals which might include truly fresh seafood, lamb, prosciutto, veal, soup, sheep cheese, salad, pizza, homemade pasta or even truffles accompanied by fine local wines. 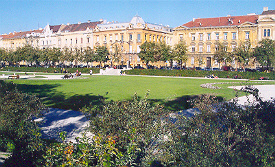 Mealtimes are special events to the Croats who enjoy a tradition of leisurely dining and socializing. Two dining experiences which I particularly enjoyed took place at Daniella Volosko’s Plavi Podrum restaurant in Volosko which serves exquisite seafood presentations and at the elegant Restaurant Zigante, specializing in rare truffle dishes, situated in the countryside of Istria’s heart-shaped peninsula. My final stop took me to the medieval resort town of Lovran situated on the southeast coast of Istria. 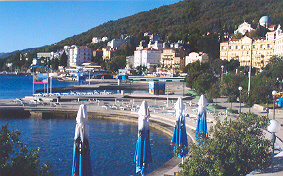 Forests of sweet chestnut and laurel trees added to the lushness of this picturesque coastal community, known as part of the Opatija Riviera with its mild Mediterranean climate. Water sports, sunning on its beaches, walks along the seaside promenade, hiking and biking rank high with Lovran visitors. Mountain climbing the slopes of the Ucka Mountains provides an outlet for outdoor enthusiasts who enjoy a challenge. One evening I dined at the restaurant of the Hotel Draga di Lovrana, high in the mountains. The scenery along and below the winding road to the top was spectacular. Once there, I was seated at a window side table offering an unobstructed view of the moon’s reflection shimmering on the sea below. I dined on freshly caught seafood, dipping my just baked bread into newly pressed olive oil while sipping a glass of fine Croatian wine, the perfect end to my visit.